Winner of 2011 Pulitzer Prize for Drama Winner of 2012 Tony Award for Best Play In 1959, Lorraine Hansberry’s A Raisin in the Sun energized the conversation about how Americans live together across lines of race and difference. 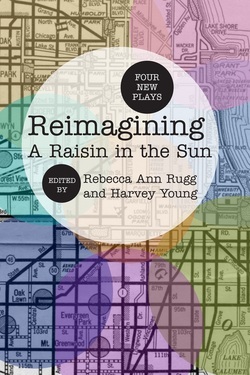 In Reimagining “A Raisin in the Sun,” Rebecca Ann Rugg and Harvey Young bring together four contemporary plays—including 2011 Pulitzer Prize for Drama winner Clybourne Park—that, in their engagement with Hansberry’s play, illuminate the tensions and anxieties that still surround neighborhood integration. Although the plays—Robert O’Hara’s Etiquette of Vigilance, Gloria Bond Clunie’s Living Green, Branden Jacobs-Jenkins’s Neighbors, and Bruce Norris’s Clybourne Park—are distinct from one another in terms of style and perspective on their predecessor, they commonly feature characters who are forced to closely examine, and sometimes revise or abandon, their ideas concerning race and their notions of social and economic justice. Above all, the plays use the lenses of neighborliness, privacy, and community to engage the large question of America’s common purpose. Each play is accompanied by an interview with the playwright about the influence of Hansberry’s landmark work. The afterword includes an interview with George C. Wolfe, whose play The Colored Museum laid the groundwork for the titles in this collection. The conversation around A Raisin in the Sun has continued unabated since its premiere fifty years ago. Rugg and Young’s book will serve as a valuable resource to fans, scholars, and students alike.